In Piacenza this year 1440 children in 12 schools collected 43,200 Miglia Verdi from March to April. 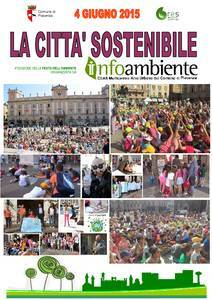 On 5th of June, the World Environment Day (WED), the best classes out of 68 were awarded during the " “LA CITTÀ SOSTENIBILE – festa dell’Ambiente”, a little festivity on the Piazza Cavalli. 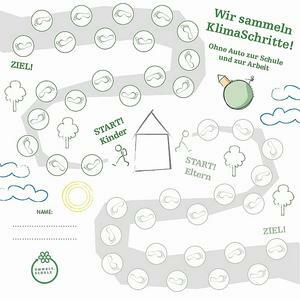 There the children played activity games, exhibited their results, sung songs and all together demonstrated that they are all able to resist Mr "Smogus", who was there again trying to persuade everybody that pollution is good and fun. 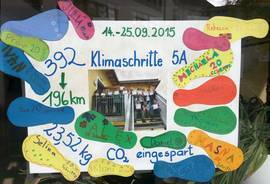 But in Piacenza they collected further Green Footprints by their Pedibus action coordinated by the CEAS Infoambiente. This year six schools (Pezzani, Fallen at Work, Mazzini, Giordani, Don Minzoni, XXV Aprile) with 283 children and about 140 passenger-Drivers were involved and collected 63,675 Miglia Verdi. Those children from the Primary Giordani’s Pedibus representing all Pedibuses also brought to Piazza Cavalli. They were accompanied by a marching band of the Piacenza Jazz Festival (the two previous Fridays they had marched with Pezzani Primary School and Primary Caduti sul Lavoro) and so Culture and Climate Action gave an extra special cooperation!. During the morning on the Piazza the representatives of the 6 institutes presented their "Pedibus postcard boxes", including the children's thoughts, proposals, suggestions and needs on safe mobility in a sustainable Piacenza. Then they received a license plate with "SCHOOL walking bus" as well as signs for their Pedibus stops and shelters for the coming school year. On behalf of all the volunteers, the Pedibus-driver Enzo Boyars, was asked to read a poem along with Lisa, one of the walking bus passangers. 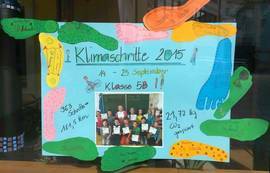 This year 208 classes and 3353 pupils took part and collected 62,763 Climate Steps. 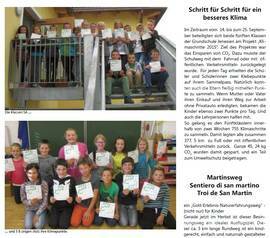 Here some of the results from the School in Jenesien as well as an article that was published in the municipal's bulletin.